Walk on water with Seajogger - the most unique and easy to use water propulsion system. Addressing the latest trend in fitness and recreation, revolutionary Sea Jogger, allows the user to exercise and relax at the same time. 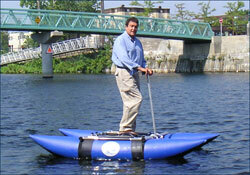 This unique and easy to use personal water propulsion system provides no-impact exercise by converting the destructive energy of impact into exercise. 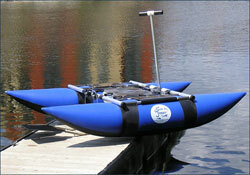 Sea Jogger is totally portable and lightweight, easy to assemble and disassemble. Sea Jogger utilizes a unique, quiet and effective fin propulsion system, which allows you to glide effortlessly on water. Using Sea Jogger is so easy, just set up, step on, and walk. Sea Jogger is extremely stable and comfortable. There is no need to take off your shoes or get wet. Just naturally walk on water. If you can walk, you can walk on water with Sea Jogger. WALK ON WATER WITH MINIMUM EFFORT! JOG ON WATER, FISH or simply TAN and RELAX! Completely portable and inflatable, Seajogger fits easily into a carrying bag.